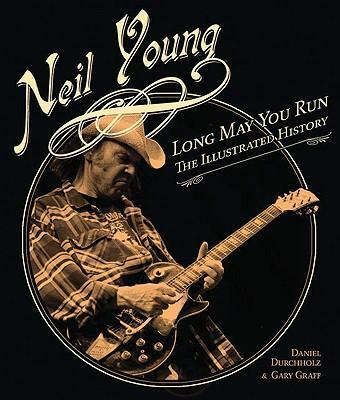 Flipping through Long May You Run: The Illustrated History -- a picture perfect documentation of Neil Young's musical story and beyond -- is the equivalent of listening to his music in an altered state. At times, it can be overwhelming. Daniel Durchholz and Gary Graff's love of Young as a person and his cultural contributions is the force of nature behind LMYR's lush 224 pages, the team effectively creating one of the best coffee table books ever. You want rare and vintage photos? Check. Reproductions of classic posters and various memorabilia? Check. A precise discography that includes 41 studio and 6 live albums, plus discussions of Young's music by his contemporaries and notable connoisseurs? Of course, it's all here. Durchholz and Graff's hard cover documentary anthologizes virtually every important moment from Neil Young's Buffalo Springfield tenure (actually, earlier) through his days with Crosby, Stills, Nash & Young, his solo career, and beyond. Dare it be said, at times, this new release seems fresher than some of Young's most recent material. But this work of passion never would have existed in such a celebratory way had our favorite Canadian and his music not left such a huge footprint on America, his deeply affecting generation after generation of fans. And if you've forgotten any of the reasons why he remains this important an icon, check out virtually any page of LMYR for your mandatory memory jog as you savor each visual of this perfect tutorial on more than 40 years of Young's long run. Mike Ragogna: Over the years, everyone--including you guys--commented on how close the Hanson brothers are. So, now that you're all marrying, moving on with private lives, all that, is Hanson still tight? Taylor Hanson: Relationships with brothers, especially when there are multiple ones...there's a certain connection that just goes deep because you share several childhood experiences. You know, venturing to the creek bed with your buddies in a Stand By Me moment, and just life lived together--scratched knees, fights here and there, and you just know each other. We've made music together for our whole life, so you can never really take away that connection. But, I would say that, definitely, as everybody has settled into different areas of their life, having family and kids, it really changes your time. We're really pretty different, as far as things we're interested in...hobbies and things like that. We're definitely scattered in our own little worlds that don't cross so much with our wife and kids and weekend warrior projects that we have. But, I would say yes, we are very close. We couldn't not be. That doesn't necessarily mean that you like each other all the time. It just means that you have a really good relationship, and have always had that, but we absolutely get at each other's throats at least once a week, you know? MR: Yup. Taylor, let's talk about the new record, It was recorded in Tulsa, right? TH: Actually, we recorded it partly in Tulsa, but the essence of the record was actually recorded in kind of a secluded ranch studio in El Paso, Texas. We have a studio in Tulsa too. We almost always record some portion of our music there. But the launch of this record was a couple weeks of sessions where we set up as a live band, just all of us in one room, and we tracked the record. Each day we would lay down a song to try and capture the sound of this record, which was more about just remembering our R&B roots, as opposed to some of the more pop and rock things that we like. So, there was a sound that went with that, a little more of a Motownie thing. Going to El Paso was just a way for us to push away from the daily grind and to truly zone in. And, interestingly, there were also elements of that studio that pulled it together too. Half of the console that's there is a Neve that is one of the original Motown boards that was then customized and connected with another console. That was kind of a cool thing, that we had a little Motown history that we were using. And that was the launching pad, I think, of the sound. At the time I was working on a side project, Tinted Windows, and I was going back and forth from that, so we did it in a couple different parts. After that session, we went back to Tulsa and did overdubs and layered vocals and all that kind of fun stuff. And then, the last piece of the record, the final chapter, were the horn sessions on the last couple of tunes that we added to the record. It was a big creative process, really, but it was kind of spread out over the last year. MR: Now, Tinted Windows was a critical darling. I saw that reviewed everywhere really, really positively, and it sounds amazing. Obviously, from playing with different players and having different musical experiences, you're going to grow from that in some way. Can you pin-point what you learned from being in Tinted Windows that entered into the mix with the new Hanson record? TH: Well, for one, of course it's great to make music with talented people. So, it was a very cathartic experience to perform with another band. It was clearly something we were just enjoying, and not having as much pressure on, just something we really were enjoying, and it's different. Musically, it really brought attention to how much Hanson really is tied to more of an R&B influence, even just the way we sing together, and play. When writing for Tinted Windows, and when playing those records which are so much more, for lack of a better word, "caucasian," the influence is just more straight ahead. And, I'd always been a fan of everything...power pop is a broad swath, so, everything from Big Star to Todd Rundgren or the Buzzcocks and Cheap Trick, for instance. Great bands, love those, been a fan, but I've always been a little more directly inspired by R&B and old rock and roll. So, it did inform the sort of defined choice to see that feel on the record a little more, and to not resist doing the horn parts. Look, this record is a sort of pop with a little bit of a throwback kind of sound, and for that matter, we're that as a band. We want that to come through though nothing sounds exactly like your influences, ever. But it definitely was apparent, so, it helped focus that in a little bit. MR: Obviously, it's everything you just mentioned--pop with a more R&B feel. And the video is pretty cool with all those dancers, like Cecil B. DeMille cast it. Your dancers are professional locals, right? TH: Yeah, they're professional, local dancers. Basically, there's a whole group in the front--about forty dancers are from Tulsa and around the state, and then that mass is just random people and bands that came from all over the country. So, the part that you're seeing more are dancers that were local, but professional, and then the crowd of waving hands and stuff, those were people that just learned it that day. MR: Pretty cool. Hey, you've done something pretty bold, more than most other bands that are still trying to figure out how to do it. You've been incredibly successful at having your own label and marketing yourself. How does it feel to be taking your career in your own hands and having this kind of success with your last three albums? TH: Well, when you're inside of stuff and you're working on it, you always sort of shoot for the stars and hit the moon, hopefully. So, on the one hand, it's the biggest part when you are a business owner. Essentially, you're an entrepreneur. They say about entrepreneurs that, like, ninety percent of them never stop working because it's your company and you just live it. I think from the point of view of being on that side of things, we're really, really proud of being a band as long as we have really strong, respectable success since that has allowed us to do what we do on our terms. That's always been the plan: How do we do what we do, and do it with as much respect in deference to what we actually want to be saying to people. So, it feels really good to be where we are, but you always sort of have to keep your vision focused forward. You don't get to sit around and go, "Oh yeah, that was pretty good. We did that. That was nice." You're constantly in that mode of building and refining. I will say, from a slightly more broad perspective, this has been a changing business, and we've had a lot of choices along the way that were, I think, easier in the moment. We've just tended to be, really, in our own ideas. I guess we're just willing to say, "That's true, that we can do this, or that. But, I think this approach is better." And we're not afraid to be wrong. I would rather know why it didn't work and bear the brunt of it on the front end, than wonder why it wasn't working and ultimately bear the brunt of that lack of success or issue that came up, and not be able to get a grasp on it. It's a good time, I think, to be doing all the junk, in the world. MR: I think it's like fourteen years since "MmmBop," right? TH: Thirteen or fourteen, it was'97. MR: Okay, thirteen years ago, "MmmBop" was a hit. You're so far down the pike at this point, though that was one of the huge records of the nineties that still gets played on pop stations, so you definitely left a mark with that hit. What are your thoughts about it in 2010? TH: The first thought is it's a song we wrote and played that was nominated for awards, and we're really proud of, you know? That's the short answer. Part of what I'm proud of now is you hope you're making music that stands out in the industry. I'm hoping I'll want to play Shout It Out music in fifteen years, and I'll still appreciate it and feel like it's not nostalgic. It's music that I want to stand by, and, that's how I feel about that record and our early records...we still feel like it's us. It's a lot of years ago, but it's still music that was you, and reflects you. So, I feel really proud of it, and I feel like I would really like for the Hanson story to be--not that we should be talking about retrospectives or anything--I would like the way people perceive our band to be that we were always a band that was sort of dedicated to the melody and songs that were not necessarily of the moment, but every once in a while, caught a moment. That's why I think "MmmBop" was never written to be a hit. It wasn't marketed or concocted, it was something that came out of who we were, and it struck a chord for whatever reason. And, luckily, the meat of your career is what you do after that, what you do with that. MR: And then there are the videos. TH: The thing about some of these is that, wow it's awesome, a couple million people have watched this video. And, wow, there's kind of a good response and consensus, you know? Like with "Penny & Me." You're proud again, you have a video that people watch a lot, and you've got a song that survived. But, along the way, we're just doing what we do. And that's what "MmmBop" was, it was a strange little pop song that introduced us and had a strong impression. MR: I wanted to talk about the writing on this record because on Underneath, you had Matthew Sweet, Gregg Alexander, Greg Wells, you some other guys chipping-in with the writing. Next, on The Walk, you had Chris Holmes and Shannon Curfman. But you guys decided you were going to write all the songs on Shout It Out. What was the approach for the writing on this? TH: The approach was that we were writing a fair amount, and there were just enough songs that came into being that had a really strong direction to them. We found ourselves at the early part of 2008 and then the end of 2008, winding up to the recording, going, "Gosh, there is a body of work now already." And, we just felt like there wasn't a necessary cooperation, to be honest. Actually, before we were planning to record at the beginning of last year, I talked to a friend, Butch Walker, who is a great writer and producer that I still talk to about writing because I said, "Hey, we should try to write for the record." And I had talked about doing that with Mike Viola as well, and lots of different people that are friends and writers and just great people. But, it just felt like we got to this point, and there was a body of work and it sounded like a record, it sounded like a certain head space. 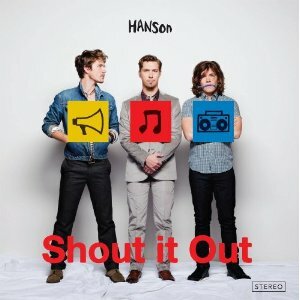 Shout it Out is the record that was really kind of written and made in-between a lot of intense things going on. We've been involved, and will continue to watch a lot of charitable actions. There's one out there for the walk to raise money for poverty issues in Africa and HIV. So, every day, we're doing that on the road. We're planning the label, I'm running off to Tinted Windows, we're sort of building our team, the whole entrepreneurial "never stop working" sort of thing. MR: So the Hanson brothers are tying everything together and revisiting their R&B roots for the new project. TH: There was a certain thing that started happening for me, and everyone else as well, where there was sort of a breath of fresh air that came from sitting down and playing and thinking and sort of getting over the hump a little bit. Being able to say, "You know what I love? I love Ray Charles." We'd talk about it all the time, but I hadn't listened to that artist or that record for a while. So, these songs just sort of popped up, and the initial kernels came out of the air between the things that we are dedicated to. Like I said, at some point we went, "Gosh, there's a great group of songs here." And, it just didn't seem necessary to do the due diligence of, "Well, if we just write with some of the people that we like, we'll come up with great songs." MR: You brought up the charity thing, and I also was going to regarding your recording "Great Divide." It was very ambitious, recording in Soweto with that amazing choir. I think that's one of the first things that I remember you working on. It tied to bring awareness to AIDS during a time when people keep forgetting about it because of every new disaster that we have to keep forming charitable organizations around. TH: Exactly, yeah. I want to say one other thing about that. I was just talking to someone a couple of minutes ago about how there's a collision of time happening in our culture because we're the last generation to live in a world before this level of technology, where everybody has a cell phone and everybody's using the internet and all that kind of stuff. With the charitable work, what we saw was kind of that same, strange meeting of worlds where you've got this extraordinarily overwhelming issue of extreme poverty in Africa, but you have an emerging world of technology and of possibility, of exchanging information. Our mission will now continue and evolve. People my age, it's our responsibility to set the bar for how we use our growing possibilities. The ways we can go more directly to a hospital in Soweto and say we're going to give directly to this group or we're going to build a company that is charitable, we're going to use that potential to set the bar. So, that's what we set out to do with The Walk, to say, "Everyone has something." We can ask for accountability, and we're trying to sort of--well, it's a bad way to put it--but re-brand giving and charity, and turn it more towards how we put our talent and our capabilities and put those to work and ask for better accountability and not just give it away to a big fund to trickle down. The issues in Africa, my children will still be talking about them, I'm sure of that, but my hope is that my kids, they will have said, "You know, there was a shift that happened. My dad's generation, they started to get on board with the issues in not such an arm's length way. Let me get my hands dirty, I'm going to start just being more realistic about this, more direct, more one for one, and not just talking about being charitable one day. We'll use the possibilities of connecting with one another and going direct to these issues and being more focused about it." Anyway, I think I might have lost the plot of the answer. MR: No, you said it in a way that's quite inspirational. So, I normally ask all artists what is your suggestion to new artists that are up and coming. Not in your case. Because of the awesome stuff you just said, what is your suggestion to new artists, and people in general, on how to get involved in charitable organizations, and how can they tell which ones to participate in? TH: That's a hard question. Only because I care about the answer and you want to give good answers to that kind of stuff. The essential part, without saying, "You should give to this group or that group"--because it's not about that--is to really internalize the message that might seem to lose it's meaning because it has been used in a way that has been disingenuous though it really is true. You really, really do just have to start. I mean, I struggle with that. Everyone struggles with that question of starting and being honest to where you're not jaded and fragmented. And you really just do have to start. Start with something that is almost embarrassingly small, and you will find yourself being the person that others remember, "Hey, when you did that, that made a difference and that inspired me to do something." Really, that's what happens. And, regardless of what your passion is about--and I could talk a lot specifically about AIDS groups in Africa and our work--that's the essence of it. I think you've got to use what you have. Start thinking about what you do on the weekends, what you do after work, look at what you do already, look at the talent you have, look at the relationships you have, and try to orient with what they're going to do--something you can maintain, that connects with your life's work, what you actually do contribute to the world. Because that's going to be your best way to get things done that you care about. MR: It was great to see this side of Hanson. I really appreciated our conversation and your time and, of course, your music. TH: Absolutely. Thanks for being aware of the music. It's always nice to talk to someone who's obviously digested it. The following is a Q&A with Mathew Vlasic, the guy who can explain why the faces of classic artists and bands are now being woven into products of the Sony Music's new company, The Thread Shop, through its Archive 1887 line of clothing. 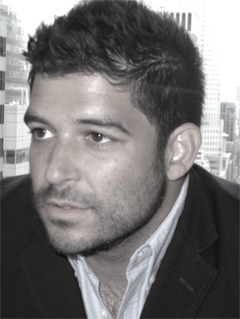 Vlasic serves as Archive 1887's president, and he offers insights into why this company's branding differs from other labels' approaches to merchandising. Q: Sony Music is not the only label with a merch company. How does Archive 1887 differ from what the other labels are doing? Do you see this as a viable new revenue stream? 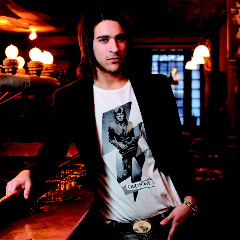 A: Archive 1887 is a fashion brand launched by Sony Music's merchandise company, The Thread Shop, for summer 2010. We created this line to present a more fashion-forward product for vendors like Barney's who cater to a different consumer than traditional music merchandise retailers. Q: How did you choose which artist's photos to use on the shirts? A: We have access to over 2 million photos so it was extremely daunting. In the end, it really boiled down to a combination of what we thought were the strongest for our first season and the artists', or their estates', desire to work with us. Q: What photographers are involved in Archive 1887? A: We work with Mick Rock and Jim Marshall images as well as Don Hunstein, a Sony Music staff photographer from 1956-1986. Q: Where are the shirts sold and how much do they sell for? A: We are sold at Barney's New York and better department stores, plus specialty boutiques across North America and will be expanding to other territories in the near future. The shirts retail between $49 and $58. Q: Who is your target market for these shirts ? A: It's quite a large target market; everyone from fans who are looking for an authentic music t-shirt to fashionable consumers who value quality materials and rare graphics. Anyone who appreciates art, music and fashion, as this is really a great demonstration of the three coming together in one innovative product. Plus everyone gets the bonus of discovering great iconic music. Q; Tell me about the music playlist that comes with each shirt? 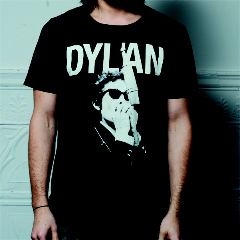 A: Each shirt comes with a curated playlist that features music from many of the artists in the line. The idea here is to try and broaden the musical tastes of those who do not have the classics readily available to them. Q: How many more designs does Archive 1887 plan to make? A: We plan to keep going for as long as the archive is full of treasures to discover! 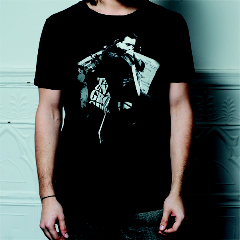 We will put out a collection roughly four times a year with new graphics as well as carry over styles. A: First and foremost we were inspired by the music, history and imagery that can be found in our archive. We wanted to bring the experience of being there during great moments in music history to our customer by sharing our access to imagery, photos and iconic memorabilia. What better medium than clothing (which almost everyone wears) to share these relics. Q: Are any of these shirts worked into new 360 deals with the artists? A: No, they are all separate merchandising deals for the most part that were worked out with the artists or through their estates based upon strong relationships we have carried with them for many years. Q: Do you foresee Archive 1887 expanding into other forms of merchandise? A: Yes and plans are already in place for additional products that will reflect our incredibly high quality of standards and design. Q: Will there be any multi-label cooperativeness, maybe even in the "Playlist" merch? A: The artists in the line are drawn from different labels within Sony Music Entertainment so yes, very much so. Q: What does the future hold, in general, for Archive 1887? At what point will the venture be considered successful? A: Well there are different measures of success. Did we succeed in getting our message out, did we succeed in properly positioning our artists, did we succeed in making a great product, did we succeed in creating a new revenue stream? All of these will be factored into the answer to that question and now is a bit too early to make any judgments. I will say that I personally would consider it successful if we can expose the music and imagery of our iconic artists to both a new generation of fans as well as the existing fan base.